1 Fakes then takes off long. 3 Fakes long, then comes to ball. 4 Makes sure she is not under the basket, then looks long to 1, short to 2, or short to 3. Then runs the basket to basket line. 5. Cuts to foul line for reversal of ball if needed. 3. Brings ball across half court if allowed, also is looking up at 1. 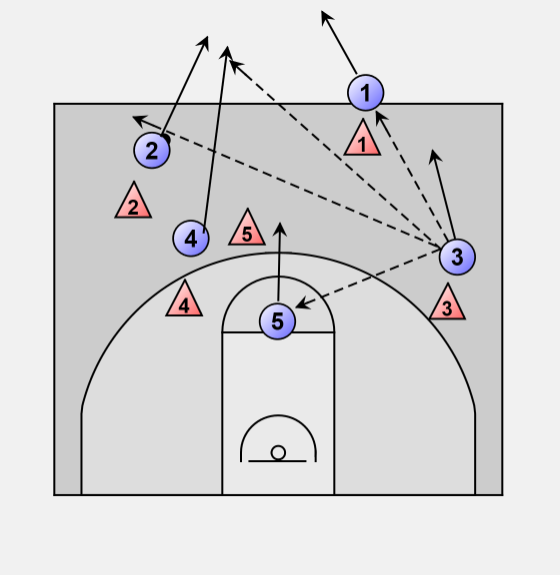 If stopped, reverses ball back to 5. 4. Continues running basketline looking for pass for easy layup or to dish off to teamates. 5. Is the trailer, or passes ball to open person down court.